- The club's name is located on the front of the shirt. - The club's name is located on the rear of the shirt. - There is a faint jaguar pattern at the bottom of the shirt on the front. This shirt has a cool jaguar skin print woven into the shirt material. On top of that I am enjoying the colour scheme used here. The green, white and orange work together really well. The one thing that I don't think is necessary for this shirt is the presence of the Chiapas text on the front of the shirt. I can understand it being on the rear but it makes the front side look too crowded in my opinion. Since this club no longer exists it has certainly resulted in the shirt becoming more important and special. 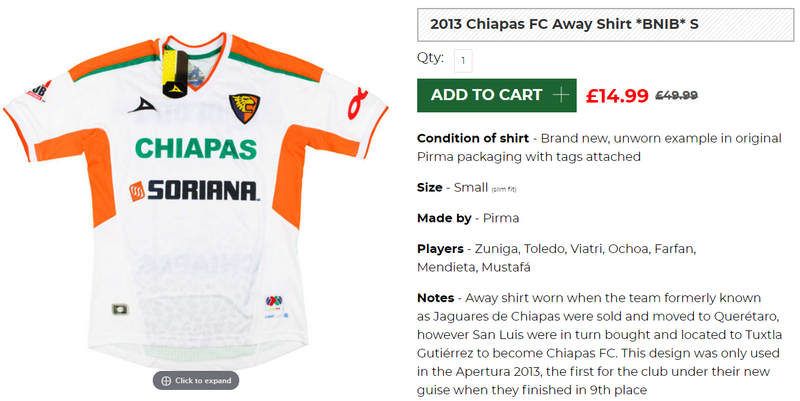 On May 20, 2013 it was announced Chiapas Liga MX team Jaguares de Chiapas was sold and relocated to Querétaro, Mexico. On May 28, 2013 it was announced the team San Luis was relocating to the city of Tuxtla Gutiérrez and was renamed Chiapas Fútbol Club, thus bringing back a first division team back to Chiapas. The new Chiapas franchise took over the San Luis television contract with Televisa.